March'25 2018 we hawe new born kittens! March'16 2018 we hawe new born kittens! March'13 2018 we hawe new born kittens! We have news from cat show! 15 Dec 2016 we hawe new born kittens! we hawe new born kittens! Siberian and Neva Masquerade cats in Russia "Iz Odissei"! Cattery Iz Odissei is engaged in successfully breeding of cats for 15 years. During the work we got a lot of experience competent breeding excellent cats. Therefore, our cattery has established itself worldwide as the best. We regularly, several times a year, we participate in international cat shows. At each show cats of our cattery always receive high marks, nomination for BIS, and become Best in Show. This is evidenced by the high quality of our breeding cats. polycystic kidneys (PKD) and cardiomyopathy (HCM). The result is negative, the animals are healthy. Twice a year our cats are tested for infectious diseases: Feline infectious peritonitis (FIP), Feline immunodeficiency viruses (FIV), Feline leukemia virus (FeLV), mycoplasmosis, chlamydiosis. The result is negative, the animals are healthy. We believe a good healthy kittens need to grow: to correctly feed mother-cat; to keep clean the place where there are kittens; competently the kittens diet from the first days of feeding little kittens, only use food and premium products, as well as the only high-quality, non-toxic excipients for cat's toilet. Our kittens leave home not earlier than will be vaccinated against: feline calicivirus, rhinotracheitis, panleukopenia (feline distemper), re-vaccinated against these diseases again, as well as vaccinated against rabies. All our kittens are easily trained to walk in toilet already in the one months of age. When you move a kitten to you, we will share with you their knowledge. They will help to avoid problems with the toilet a kitten on arrival in a new home. Breeders cattery Iz Odissei pay great attention to the kittens social adaptation and the formation of their character from the first days of life of kittens. All our kittens are very affectionate, outgoing, not afraid of children. We Shipping our kitten in any country, in any city around the world. We provide Shipping only with reliable couriers and Avia company with a good reputation in regard to animals. We have our own base couriers and companies and we will be choose for you the best and most cost-effective option. You may not agree with this and offer your company or courier. 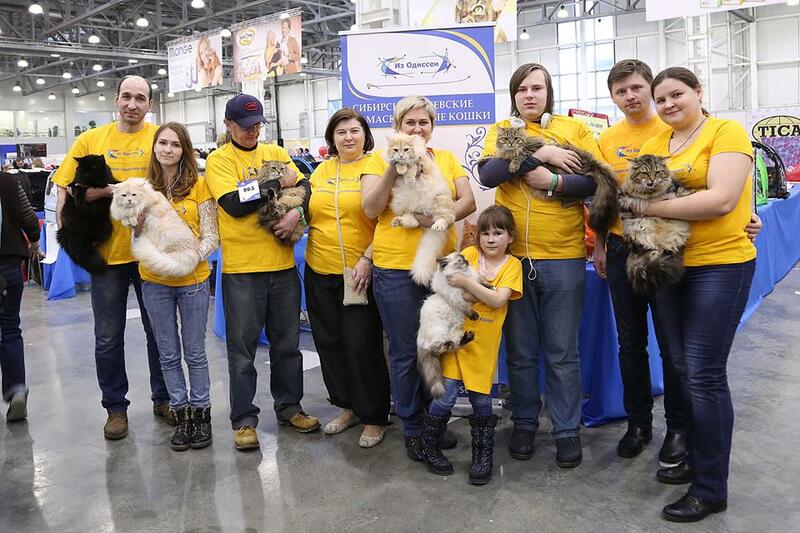 We are always pleased when buying a kitten in our cattery you go with him to cat show . Since this is not an easy task, requiring specific knowledge, from entry to the exhibition, ending grooming animal, we are happy to share with the owners of our kittens to our experience. And then to participate in cat show was for them not to stress. All materials of the site have property rights. only with the written permission of the administrator and with the direct reference to the site.